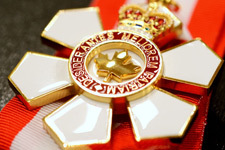 Four Western alumni and a King’s University College professor have been appointed to the Order of Canada, one of the country’s highest civilian honours which recognizes outstanding achievement and dedication to the community and service to the nation. Dr. Peter Fowler, MD’64, an internationally renowned orthopedic surgeon and professor emeritus in the Department of Surgery at the Schulich School of Medicine & Dentistry, was named a Member of the Order of Canada for his pioneering contributions to the development of sport medicine in Canada. The co-founder and former medical director of the Fowler Kennedy Sport Medicine Clinic, Fowler has served as Chief Medical Officer to Canadian national teams at the Commonwealth and Olympic Games, received the Sport Medicine Council of Canada Lifetime Achievement Award and was the first recipient of the Western Alumni Professional Achievement Award. Carol Hopkins, a King’s professor of social work from the Delaware Nation at Moraviantown, was recognized with an Officer of the Order of Canada designation for her contributions to the fields of addictions and mental health and as an advocate for culturally based treatment services. Hopkins said she hopes her work has shown that traditional teachings and cultural practices can help First Nations people overcome addictions much more effectively than Western techniques alone. She recently developed a new advanced practice with Indigenous peoples Master of Social Work course for King’s. Also honoured by Julie Payette, Governor General of Canada, were Madeleine Paquin, HBA’84, with a Member of the Order of Canada for her achievements as a business leader in the marine industry and environmental management, along with her commitment to governance; Dr. Barry Pless, MD’58, BA’61, with an Officer of the Order of Canada for his dedication to improving children’s health as a champion of injury prevention through research and advocacy; and the late Jay Switzer, MBA’83, with a Member of the Order of Canada for his exemplary leadership in the Canadian broadcasting community and for his mentorship of emerging Canadian artists and filmmakers.